Following a remeasurement after complaints were received both from runners and the runbritain rankings of a short course being used for the Manchester Marathon in 2015 and its remeasurement in October 2015, a possible contributor to the short course was identified as the calibration course in Middlewood Way which was used to calibrate the bicycle wheel. An independent check, by a measurer having calibrated on an alternative calibration course, identified that the Middlewood Way course was short by 0.5%. Accordingly we have identified below all courses which may have been affected. The following certfications may have been based on use of the Middlewood Way calibration course. Thank you very much to the measurers who have volunteered to remeasure potentially affected courses. So far, 2 June 2016, 8 affected courses have been remeasured: 2 were correct and 6 been found short - by between 0.2% and 1.0%. 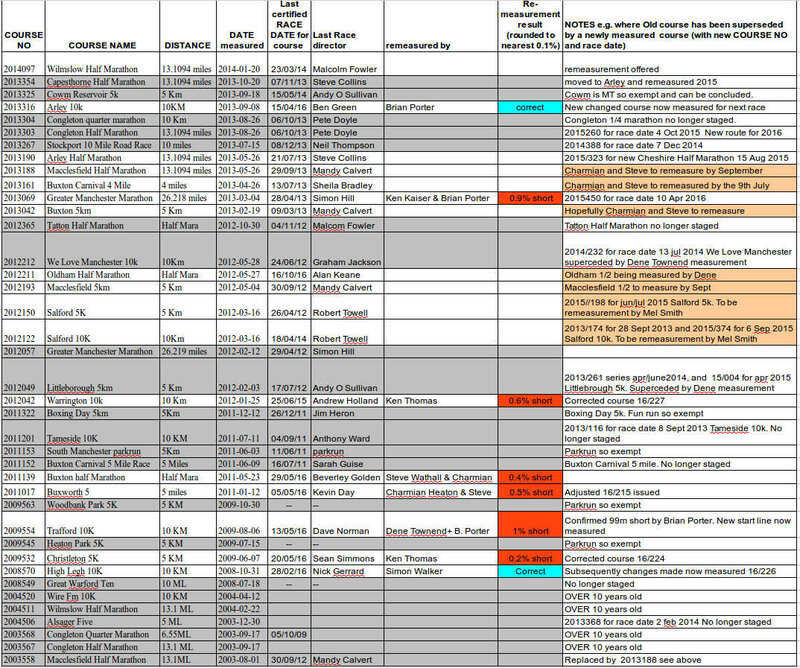 7 Courses, highlighted in orange on the list below, are still to be remeasured to ensure their accuracy for future events. Remeasurement is not currently planned for courses not marked in orange since they appear to be no longer in use. In the right hand column where we have been able to identitfy a newly measured course which superceeds the original we give the new course no.